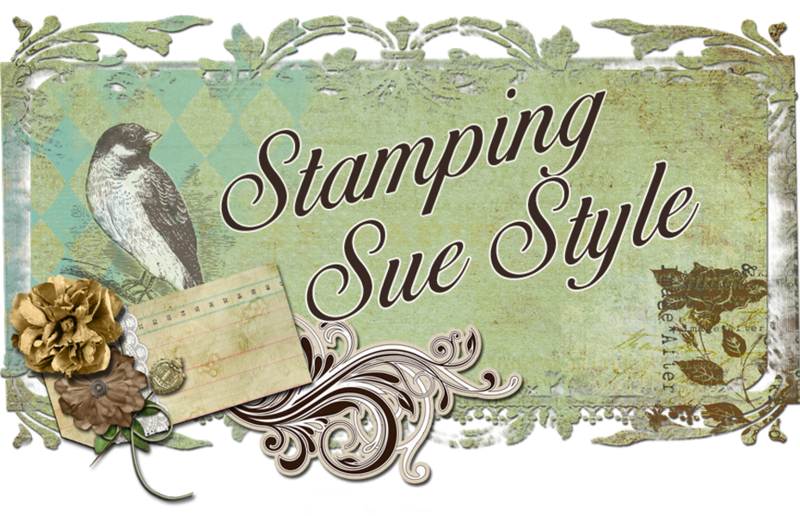 Stamping Sue Style: Having the Blues ! 'Oh So Blue' -- This time of year it is easy to start feeling blue now that the festivities surrounding Christmas are over and winter is making its presence known with less sun and more miserable weather so instead of giving in to it let's celebrate blue. Create a primarily blue mixed media project that includes some stamping and/or stenciling. You may add one other colour to your creation but it must be mostly blue. I've had this shaped canvas for ages and while I was mulling over ideas I spotted it and decided now was the time to use it ! I was very lucky to attend a workshop with Tracy Scott and inspired by the techniques she shared I wanted to have another go. 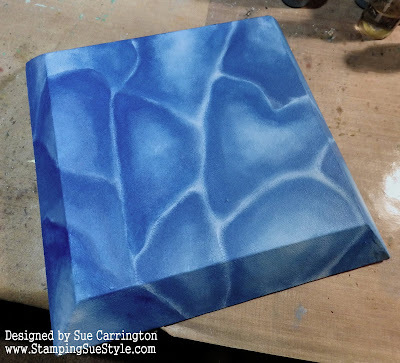 I painted the canvas with Oyster Blue Fresco Finish paint then started to build up the colours in segments. 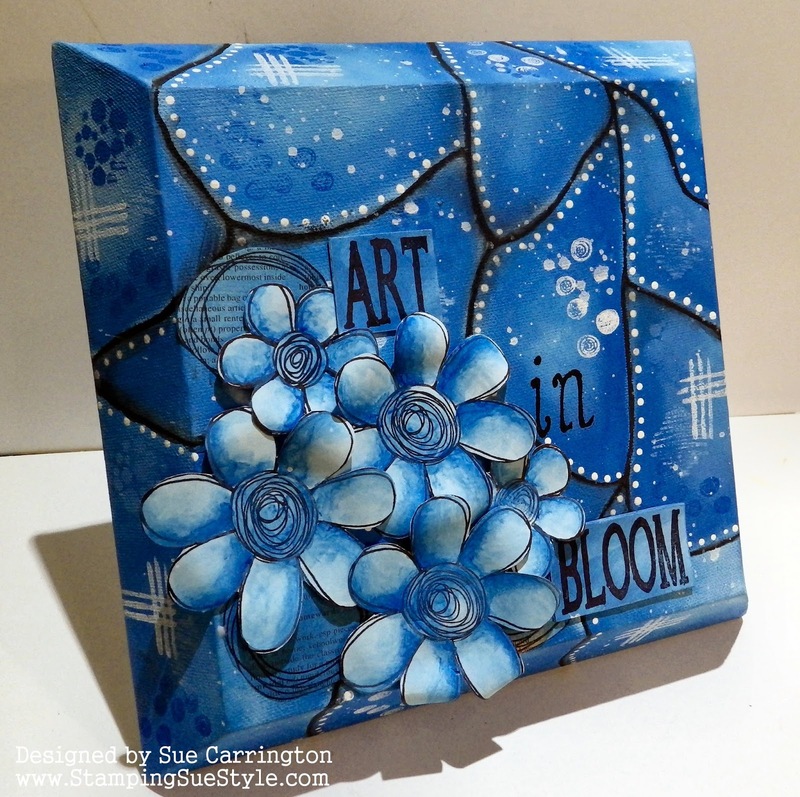 I used Emma Godfrey's new stamps and stamped in the segments using Snowflake and Blue Glass Fresco Finish paints. The black lines are drawn with a black Stabilo pencil then with a damp paint brush the lines are painted in. To add the white dots I used Snowflake Fresco Finish paint and the end of paintbrush dipped in the paint. The flowers were all stamped onto Smoothy card that I painted with Blue Oyster Fresco Finish paint. 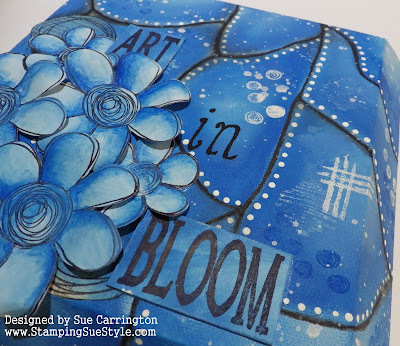 I then blended China, Smurf and Blue Glass Fresco Finish paints to add the shading on the flowers. The scribbly circles are stamped onto dictionary paper that I've painted and then they've been cut out. The words Art and Bloom are stamped onto painted Smoothy card and I've drawn in the word 'in'. 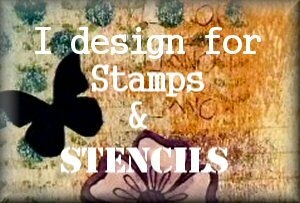 I hope you get chance to join us for this challenge and do make sure you hop over to the Stamps and Stencils blog to check out the rest of the DT's fabulous projects. Oh wow - I loved this before you ever started adding anything... that background is INCREDIBLE Sue. And the end result.... BLOOMIN ARTSY FABULOUSNESS at it's best. Wow. LOVE. Happy NEW YEAR... XO j. Beautiful! 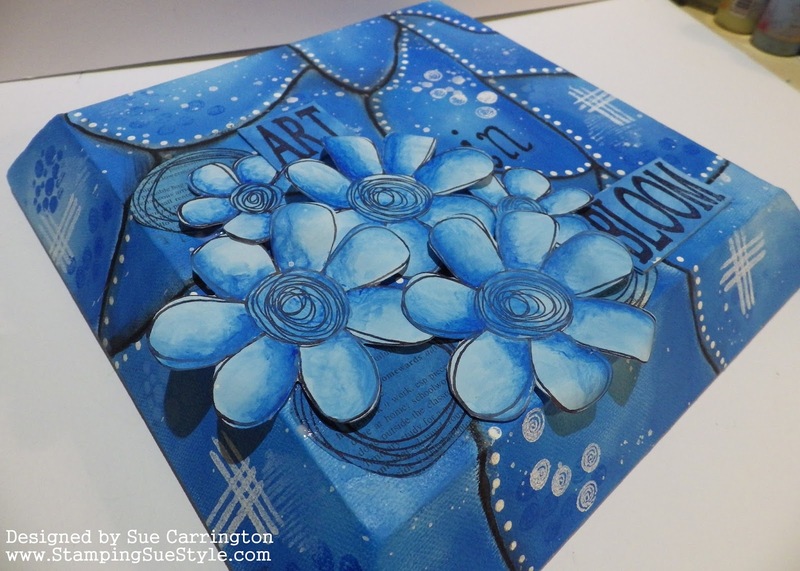 I love the vibrant shades of blue and the flowers are gorgeous! Absolutely beautiful make, Sue! Love it to bits! Simply stunning piece of art! Sue, this is just gorgeous!!!!!!!!! Love, love, love it!!!!!!!! Wow, this is fabulous. I love how each section of the background has its own shading and depth. 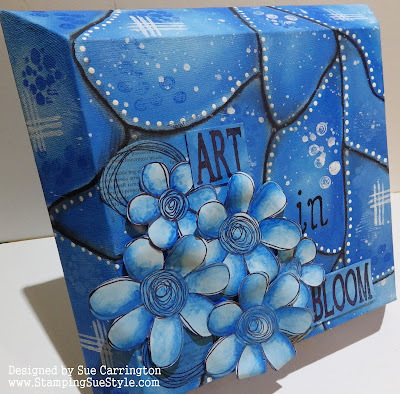 Love your flowers and sentiment and all the scribbles and splotches and outlines make everything pop from this brilliant blue canvas. Wonderful canvas Sue and fabulous take on Tracy's technique which you have made all your own here! Love the shading on those pretty flowers too! An amazingly crisp and clear mixed media project. Love this.